Kyiv Hydroelectric Station ( Kyivska hidroelektro stantsiia im. Leninskoho komsomolu). Part of the Dnieper Cascade of Hydroelectric Stations, the station was constructed between 1960 and 1968 on the Dnieper River near the city of Vyshhorod. With 20 generators, the Kyiv HES has a capacity of 361,200 kW and an average annual output of 767 million kWh. 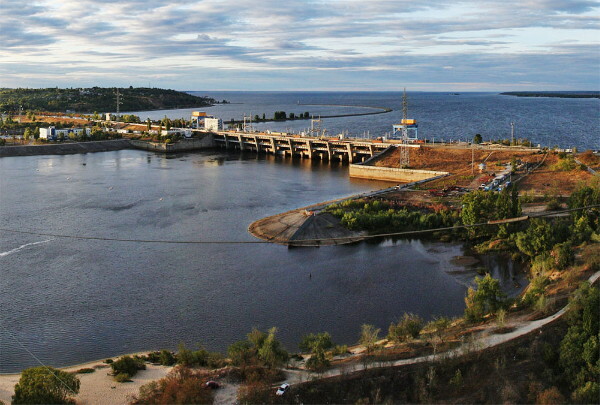 Besides the station building, the Kyiv HES includes 75 km of dams, which hold back the waters of the Kyiv Reservoir, and a one-chamber lock. The Kyiv HES has a history of worker resistance to the Soviet regime's economic and nationality policies. In 1968 former workers of the station—Nazarenko, Kondriukov, and Karpenko—were arrested by the KGB for distributing leaflets at Kyiv University and the Kyiv Agricultural Academy calling for resistance to forced Russification. In May 1969 a major strike, led by I. Hryshchuk, occurred at the station. In 1969 a petition to the CC of the Communist Party of the Soviet Union signed by over 600 workers of the Kyiv HES and residents of Vyshhorod demanded I. Hryshchuk's release and an end to management and government violations of workers' rights. One of the most famous Ukrainian dissidents, Viacheslav Chornovil, served as secretary of the Komsomol Committee of the Kyiv HES and as a journalist at the construction site; he was active in the struggle for better working and living conditions. In the early 1960s the labor force at the site consisted of 70–75 percent Ukrainians, 20 percent Russians, and 2 percent Belarusians. Yet, almost all of the top jobs (construction chiefs and engineers, sectional and divisional managers, etc) were held by Russians. Almost all the 127 Russian managers at the main installation came from Russia. Only 11 of them were born in Ukraine.